I love risotto and, I make them quite bit of variety. Back in Japan, porridge (okayu) is probably most close to risotto dish although porridge tend to be less fattier because we add in probably just egg and soy sauce with pinch of salt (sometimes, just salted strip of kombu seaweed ) and tend to be very simple and very lean. Porridge there is treated like “Chicken noodle soup” in USA and often times, person who got sick or who has digestive issue tend to eat it to heal. Of course, it can be cooked different way to enjoy regular meal time. If you have not made risotto,try making one. It is one pot dish and, they are 30 minutes meal and great for those who has pressed time and would like to spend less time cooking. Plus,you can put whatever in the fridge/freezer using the same base, and you can be creative and make your own risotto and have fun with it. I feel people who say they do not like green peas is probably from mushy texture from overcooked green peas. You can prevent the peas from being over cooked by adding them in at the last 3-5 minutes of cooking and you get nice bright colored peas with non mushy, sweet bursting texture and they might actually enjoy them. I eat green peas but I hate mushy green peas too. If you had leftover risotto, add mozzarella cheese to the leftover risotto,make a meat ball size ball,and dip it in flour, then dip it in lightly beaten egg, then, coat the ball with panko bread crumbs then fry them. 12. 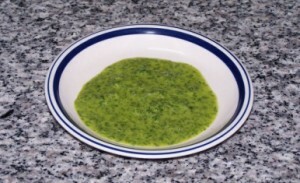 Add remaining green peas puree and cook for a few minutes and take off from the heat and, add in 2 tbs heavy cream, 1/2 tbs butter stir , and add in 1/4C grated Parmesan cheese and stir and taste and adjust the salt and pepper and seasoning. 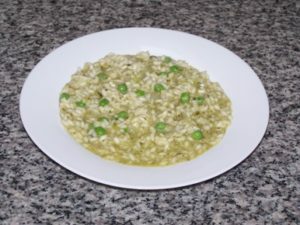 ** When you make risotto, one thing to keep in mind is that you must keep stiring and add liquid 1C or so at a time and wait till liquid is absorbed and then another 1 cup of liquid is added. Usually rice becomes al dente in about 18-20 minutes. Beef stroganoff is one of my favorite pasta dish. Generally, strip of beef is sauteed in butter with mushroom and cooked in creamy sauce, and pour it over the pasta. My Stroganoff dish is a little different. Steak of your choice is cooked separately in the skillet, and you can enjoy much more tender satisfying dish since strip of beef steak is not cooked in the sauce to well done.Also, since you do not have to spend time cutting the steak into thin strip first, it might be bit time saving as well. If you wish to cook in the skillet, in the sauce, I think ground meat might be the better choice for the dish. 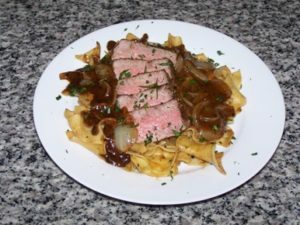 My favorite way to cook up the stroganoff is to use mustard and Beef broth and a little sour cream, and instead of using shallot, I like to use sweet valida onion for that. If it was not ate desired doness to you, cook 2 minutes each side and cook until internal temperature reaches to your desired doness. 4. When it got thicken, mix in 1/2 tbs sour cream and pour it over pasta. Every now and then, I make pizza from scratch. When I make pizza from scratch, it makes our house smell like bakery shop. I really like that. Freshly baked bread/pizza right out from the oven is really tasty. I think that pizza is probably the most versatile and popular food in the states, and many of you would enjoy my pizzas too. Therefore, I thought I would share the recipe with you one flavor at a time every time I make a new one. This time, it is Teriyaki Chicken pizza. 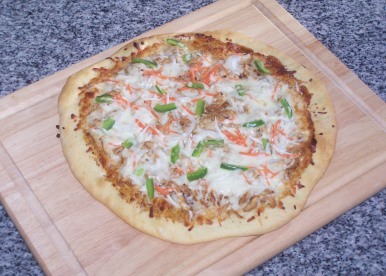 It is my take of classic Japanese Teriyaki chicken dish, and made it into pizza. The sauce maybe a little different than I normally would have made (Americanized version of the sauce) because I wanted the sauce to be thicker than regular sauce and I had to use the brown sugar instead of usual white table sugar for that purpose. ** To make pizza, if you were pressed with time, you can buy fresh pizza dough or use flat bread instead. ** Water temperature to rise the dough (proof the dough) should be at 110F-115F. Lower temperature water would not proof the dough properly, and higher temperature water would kill the yeast and would not proof the dough properly. ** For EVOO, first-cold press extra virgin olive oil is the best and tasty. My favorite brand is “Colavita brand”. It is product of Italy,and you can get them at local grocery store. I have tried some other extra virgin olive oil too, but Colavita brand was the most flavorful,fruity and tasty olive oil of the bunch,and I use this oil for everyday cooking as well. 5. Knead the dough until it is not sticky, but smooth surface and elastic. I usually knead for about 8 minutes. You can test your dough to see if you knead it more. Do the Windowpane test. ** Using the preheated/turned off oven to rise the dough (proof the dough) is perfect weather proof method. 16. Pierce the pizza dough with fork,just inside the 1″ margin from outside circle. And then, bake the pizza for 7 minutes. 17. Take out the pizza dough and pour some Teriyaki sauce, teriyaki chicken, vegetables, and cheese. 18. Bake the pizza for another 12 minutes till the cheese gets melted and bubbly and the edge become brown. 1. In the sauce pan pour water enough to cover 4 strips of boneless skinless chicken tenderloin. Then, pour some sake and sprinkle some Steak seasoning from Grill mate brand. A slice of Teriyaki chicken pizza.. If you had leftover pizza, you can wrap them with foil and bag them up in the freezer bag for later quick lunch/dinner. To reheat the pizza, if you use oven, you want to preheat the oven at about 425F and heat the pizza up wrapped in foil for about 20 minutes or so. 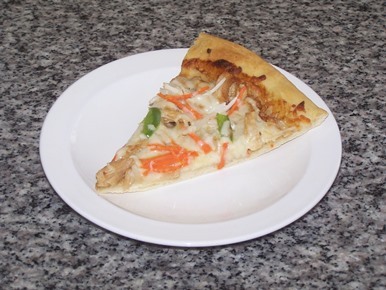 If you use microwave to reheat the pizza, take the foil off,place the pizza in microwave safe plate,wrap the pizza with paper towel,microwave about 40 seconds or so. By now, you already know that I am from Japan and I had never tasted such a wide variety of cuisine you can dine in over here in the states. I enjoy food culture very much here and, always I get inspired by some dishes that I tasted somewhere. Mexican food was one of those new cuisine for me when I first stepped my foot inside the states.I had never had chili, I had never had tortilla, I had never had burritos…..
Now, I love Mexican food a lot, and we like to go to Mexican fast food restaurant “Chipotle” now and then. Our 2 year old son “Liam” is not a fan of spicy items such as barbacoa (Spicy shredded beef) but he does enjoy carnitas and beans and tortilla etc. Because of him, I do not make spicy food anymore, but before he was born, I made this pan fried pork with spicy maple sauce served with bean, cilantro rice and vegetables. I made it in quick and easy way and,it came out good. Here,I would like to share the recipe with you. Pan fried pork cutlet with spicy maple sauce..
1. In the skillet, drizzle extra virgin olive oil and add 1/8 Green pepper sliced , 1/4 Orange pepper sliced, 1/2 sweet onion sliced and sprinkle “Morton’s Nature’s seasoning” and when it is just about done, sprinkle touch of grounf Ancho chili pepper and stir and cook a minute or so. My grandfather was a head cook when we get together for cerebration and I liked helping him making dishes,and I enjoyed watching him cooking as well. Potato salad was one of those side dishes he made now and then and I liked it very much. Coming to the states, I tried different kinds of potato salad such as American potato salad, German potato salad for the first time. Those were different from what I have had in Japan; Japanese potato salad often times have steamed carrot, steamed or raw onion, raw cucumber, strips of cooked ham and potatoes are mashed and seasoned with vinegar and mayo. My grandfather loved including fruits such as slice of Apple or canned fruits like mandarin orange from a can.I loved his potato salad very much. Our potato salad is a bit different, especially my grandfather’s. I did not care for American potato salad as much when I tried it. Celery pieces in it was a little too much for me. I was also not so much fun of American mayo. Japanese mayo and American mayo is different in taste and ingredients is also different a bit. I personally prefer Japanese mayo better. American mayo ingredients go; Soybean Oil, Water, Whole Eggs and Egg Yolks, Vinegar, Salt, Sugar, Lemon Juice Concentrate, Calcium Disodium EDTA (Used to Protect Quality), Natural Flavors. Japanese kewpie mayo ingredients go; Vegetable Oil (Canola Oil, Soybean Oil), Egg Yolk, Vinegar, Salt, Monosodium Glutamate, Spice, Natural Flavor. After trying American potato salad, I tried German potato salad. It was more of vinegar base salad and I really liked it very much. I later learned that the ones that I tried making is more likely Americanized version of German potato salad and not authentic German potato salad,which will be made with broth vinegar base, but still, it was tasty. 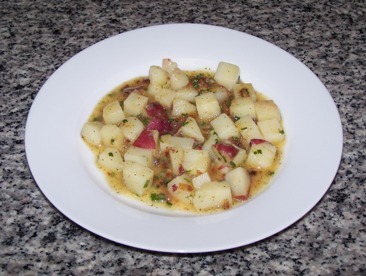 In this entry, I thought I would like to share the German potato salad that I made, and liked very much. 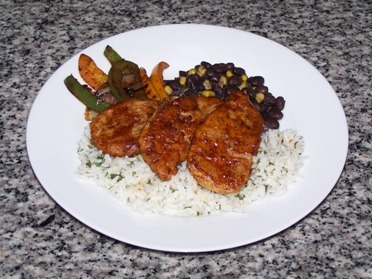 This recipe is Not the authentic one, but Americanized version one. ** I sometime like to use dill instead of chives.It is very good with dill as well. Mexican food is one of the cuisine that I had never tasted in Japan. I had never had Chili, Salsa, Cilantro, Quesadilla and more. It is the cuisine that I have discovered after coming to the states. For me, cilantro has unique taste, and I did not care for it at first but, I started liking it later on. I much prefer coriander spice (seed of cilantro) though. Because it got lemony taste and I like that. You may wonder what is the difference between cilantro and coriander. In the states, the leaves and stalks of the plant are referred to as “cilantro,” while the seeds are referred to as “coriander.” Essentially the same thing but, I think seed and plant itself (leaves and stalks) have different taste. I like Mexican food now and, I make it now and then. 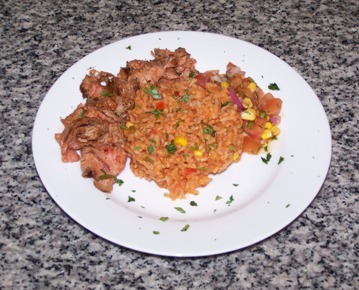 In this entry, I would like to share the recipe of Fresh salsa, Salsa rice, and grilled steak with you. till the skin gets blisters. 5. Time to time, rotate the pepper and wait till all sides are with blisters and bubbly, take it out from the oven and toss them into a bowl and seal it with plastic wrap. seed off and cut off the stem. 5.Add 1 2/3C water, pinch of kosher salt, and cook on medium low for 10 minutes, and lower the heat to simmer and cook 10 minutes more. For the steak,I like to use flank steak. 1 lb of flank steak makes good amount of grilled thinly sliced steak. 1. Take out the flank steak package 1 hour before the cooking time. ** For medium,take the steak out when meat thermometer reads about 130F-135F. After taking off the meat from the skillet,the temperature will rise still about 5F-10F. My husband loves steak. I do love steak too, and I like to make various types of sauce for it to enjoy the different flavored steak. One of the sauce that I like to make is chimichurri sauce.It is very easy to make one,yet it has such a depth in the flavor in the sauce. I enjoy steak with Chimichurri sauce very much. Back home in Japan, I had never tasted this chimichurri sauce before. However, once I have tried making the sauce and tasted it,I became big fan of the sauce. Here is the recipe for you to try. I made the plate just like Chipotle restaurant; Grilled steak,cilantro rice, bean and vegetable. Only difference is that, I made the steak sauce differently. I will include my side dish recipes here as well. Grilled steak with Chimichurri sauce…. ** Do NOT Touch. Let it caramelize its surface.Just leave it alone. 4. After about 4-5 minutes,flip it over cook for another 4-5 minutes or until desired doneness. We like medium rare so,I cook until temperature goes to about 125F or so. ** IF the meat were quite thick cut and,inside temperature were below 100F and outside were all brown and crusty,you can cook the meat in the 350F oven gently. I usually bake about 2-5 minutes to see how much temperature rise to rough estimate the cooking time in the oven. ** Remember that steak temperature rise about 10F while it is resting so,you want to consider when to pull the meat to rest in the plate. 1. In the skillet, drizzle extra virgin olive oil and add 1/2 Red onion sliced, 1/4 red pepper sliced, 1/4 green pepper sliced and sprinkle “Morton’s Nature’s seasoning”. 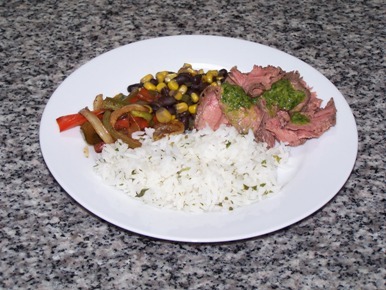 *** If you had leftover from this menu,you can chop the beef to strip,mix it with rice and everything,and warm the Tortilla and put the rice mixture and eat as Burritos,and maybe chimichurri sauce on the side. If you had left over Burritos,you can freeze it. Wrap it with plastic wrap,then,wrap it with Foil. When you need one,unwrap the plastic wrap,wrap it with paper towel very loose on microwaveable plate,then, probably 1 minutes to heat up,then, re-wrap with foil,put it in oven at 350F about 10 minutes or so and it comes out nice. decorated box or cute heart shaped containers with or without cute stuffed animals. possible chocolate for my father and for the boy I liked. In Japan, as I wrote in the previous entry titled “Loves in the Air!! Valentine’s Day in Japan“,Valentine’s day is “the Confession” day for women if she was single. Woman gives chocolate to a man she likes, and tell him that she is in love with him. If she has a boyfriend, then the day becomes the day to show him she loves him very much. he does not give answer “Yes” to the women who gave him a box of chocolate asking to become his girlfriend. In Japan,there is a day called “White Day”. It is the day men give women “yes” or “No” answer;to whom he got chocolate from. It is on the exactly one month away:March 14th. This tradition is actually still short history because it started in 1980’s. But it is a day that guy who has received “Ho n me i chocolate” gives woman candy (marshmallow,cookies,and other kind of candies) and answer “yes” or “no” to them. If men got “Gi ri Chocolate” then,it is a day to return the favor and nothing deep meaning in the candies the male workers give female workers.Simply meaning “Thank you for the Giri Chocolate”. When woman gives chocolates on Valentine’s Day,sometimes, those chocolate comes with hand-knit sweater or muffler to the man to confess her love to him. Hand-knitted stuff was very popular items to give with chocolate when I was a student. I saw girls knitting during the break for special someone. These chocolates given to special someone in love are categorized as “Ho n me i chocolate”. What it means is that it is a chocolate to confess the love. The chocolates given to other men such as father,male workmates, male boss are categorized as “Gi-ri chocolate”. love with you” but it just became tradition in Japan. Anyone can buy a box of chocolates, or can take you to a fancy restaurant for special meal created by restaurants’ chefs for the special day and, those romantic dinner dates are great. However, if you make something for your loved ones,even if you make something simple, it has lots of feeling in there, and becomes quite personal and it has a lot more meaning to it. I am sure you can put a huge smile on your loved one with something special made by you. 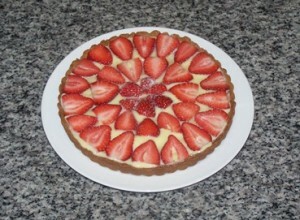 This year, I have made “Strawberry Tart” for my husband for valentine’s day. I picked strawberry as star ingredient of this dessert because our little son loves strawberry, and I was going to share it with him..
For our son, the dessert it low sugar but it still tasted good and my husband and our son loved these. In this entry, I would like to share the recipe of strawberry tart. Maybe next year’s Valentine’s day, or on your special occasion, you can make it yourself and enjoy this tasty dessert. 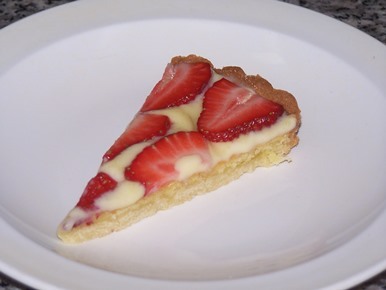 This tart is very fresh taste from fresh strawberries and tart itself is not sticky sweet.That is what I like about it. Next time, I may bake with different fruits. You can enjoy decoration by using different colored fruits as well.Color of the fruits really pops from bright beautiful color and I love using fresh fruits for decoration. Japanese cake in general use a lot of fruits, and use that as color for baked goods. This tart baking reminded me of Japanese cake baking a lot. 2. Shift the 20g (0.7 oz) almond flour, 100g (3.6 oz) unbleached all purpose flour separately into the each bowl. 5. When the dough became mixed without white spots of fliur in the dough, put it onto the saran wrap and wrap it into round dough and let it rest in the fridge for about 30. minutes or so. What can you do with leftover custard cream? 1. You can smear on the toasted bread and eat. That was how I liked enjoy leftover custard cream. In Japan, we have desserty bread at bakery and one of the kind is called cream pan (pan in Japanese means “bread”).The cream pan is the sweet dinner roll like bread dough filled with custard cream inside. 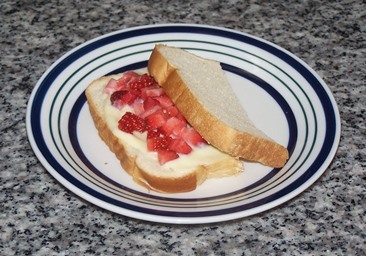 You can also use up leftover strawberry by sprinkle the berries over the custard cream smeared bread and enjoy the strawberry-custard cream sandwich. This is one of great toddler snack of the day. Liam loved the sandwich very much. As season changes and getting cold weather, nothing comforting than a hearty bowl of stew or soup for the meal. When I make the Brunswick stew, I use cut up chicken breast, but you can use shredded beef,shredded pork, shredded chicken and I think you can even use white meat fish in the stew because white fish meat goes well with tomato sauce. If you have leftover grilled/BBQ meat from previous meals, you can chop up to small pieces and use that in the soup. If you got already cooked meat you can cook up this dish even quicker. This stew recipe is a great base recipe which you can use it to make the rollover dish. This stew goes well with crusty artisan bread. I think you could even make it in the slow cooker and serve it to the large crowd. 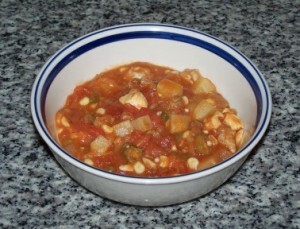 Very first time I have tasted Brunswick stew was at Williamsburg tavern in VA. Menu they served was made as it was made hundreds of years ago. When we tasted the stew, my husband loved the stew and that is why I have decided to make one at home for us to enjoy. Later, I learned that it is also the dish that is popular in southern states in the states. Since I was curious about the connection between southern style Brunswick stew and the stew we tasted in VA, I have looked into how the stew came about. New York Times ran the article about backstory of the dish in 1982. The article was written by John Herbers. According to the article, it said that a couple of hundred years ago, a hunting party in Brunswick County, Va., left a lazy fellow at the camp with a large stock of tomatoes, onions, cabbage, butter beans (limas), corn, white meat (fatback) and red pepper, and instructions to have a supper ready when the hunters returned. Disgruntled at being left behind, he threw everything into one pot, added a couple of squirrels that he shot out of the closest tree, lit the fire and went to sleep. When the hunters returned at dusk, the famous Southern dish was born. You can read the full article by John Herbers at NY Times website here. I do not know if the stew that I make is true to the authenticity but, it is, to me, tasty one and I have decided to share it with you here. I usually prepare crusty artisan bread to go with it but sometimes, I like to serve Jalapeno Cornbread.It goes well with the stew as well. 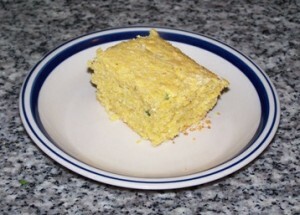 I will include my husband’s favorite cheesy jalapeno cornbread recipe here as well. 1. Pour 1C chicken broth in the sauce pan and add 14 oz diced canned tomato,2 oz whole corn kernel, 4 Okras cut to bite size pieces, 2-3 oz canned pinto beans (or lima beans), 1/4 sweet onion chopped, 2/3 medium potato cut into bite size pieces, 1 tbs white sugar, 1/4C tomato sauce and add pinch of salt and pepper. As you know, I have been making our little son solid food menu each day. When I was making one hand feeding friendly stuff, I only needed egg yolk just enough to brush his sweet potato medallion cake. Therefore, our stubby Corgi *Palette* got to taste test the Egg yolk as snack and.. I was left with Egg white. I could make egg white omelet for our son *Liam* but then, I thought, I would like to make something for us this time. Then, I looked around our pantry and decided to make meringue cookie.It does not have many ingredients needed plus it was quick snack.It was a perfect fit. This turned out to be that good. I did not bake the cookie at really low temperature like most meringue cookie recipes. I baked it like Macaroon cookies. If you know me through baking/cooking entries on this blog, you can notice that I love cooking food with liquor or wine. I think liquor or wine added to food deepen the flavor and makes great tasty dish,rather than one dimensional dish and I love using them. Just about finished cooling the cookie, my husband came to the kitchen, peeked at it and I had to tell him to wait for the nibble. He patiently waited until I place the plate nicely to take the picture and when he thought it will be more than it can fill the plate with, his hand reached over and took one off from the rack. He then left the kitchen a bit but came back and said to me that it was so good that he wanted one more. I do not expect it to survive to his workplace without being eaten by him. He really loved them. Looking at his reaction, I thought that I would share the recipe with you. I named this *Skinny* because it git about half the sugar than regular recipes you see on the net. I do not like sticky sweet snack and, I think this treat is very light and airy and has nice crisp texture outside, right amount of a little chewy texture inside with right amount of crunch from the sliced almond used for the garnish. I myself enjoyed nibbling them too. This cookie is made with Amaretto,which is Italian Almond liquor. Great snack to go with a cup of coffee. 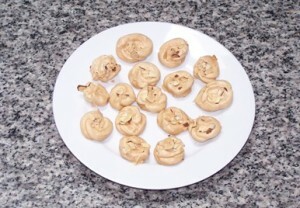 Yassy’s skinny Almond meringue cookies..
2. In the dry clean bowl, add 1 Egg white and beat till it gets foamy. 3. Add a little bit of white sugar and beat to soft peak; it is when you upside down the beater, you see the tip fold down a bit. 5.Beat until stiff peaks; it is when you upside down the beater, the tip would not drop down and can hold perfectly.Tip should staright up and hold the state. Also, you can notice that the mark in the beaten egg white would not melt into the egg white. The beaten egg white in the bowl would look like very shiny,thick and heavy looking. 6. Place the egg white into the zip bag (sandwich bag) and cut the one side corner so you can pipe out the meringue onto the non stick cooking sheet. 7. Pipe the meringue onto the non stick foil about 2″ apart and sprinkle rough crushed almond slices . 8. bake about 25-30 minutes or it gets brown around the edges or on the bottom gets nice light brown.